Figure 1. 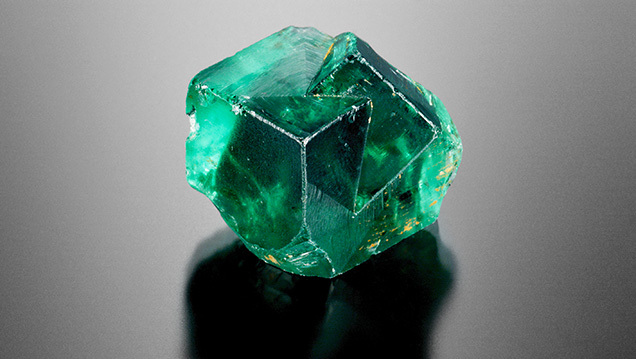 This 41.98 ct cluster of transparent green fluorite cubes contains a large primary two-phase fluid inclusion that was trapped between the cubes as they developed. Photo by Diego Sanchez. The very lightly etched green fluorite crystals that come from the Rogerley mine, located in Rogerley Quarry, Weardale, County Durham, England, are well known for the beautiful bright fluorescence they display. Rogerley mine fluorite is highly fluorescent, turning bright bluish white on exposure to long-wave ultraviolet radiation. The fluorescent fluorite from this locality will also take on a purplish color in sunlight. This effect, known as “daylight fluorescence,” appears to be unique to fluorite from the Weardale area. Research has shown that this intense fluorescence is due to an elevated rare-earth element (REE) content, including the elements cerium, lanthanum, neodymium, samarium, and yttrium. Figure 2. In this registered pair of images, the movement of the gas phase in the fluorite cluster can be easily seen. Photomicrographs by Nathan Renfro; horizontal field of view 6.54 mm. The Rogerley fluorite specimen shown in figure 1 measures 17.68 × 17.38 × 13.50 mm and weighs 41.98 ct. What makes this specimen the subject of this issue’s “Quarterly Crystal” is the presence of an eye-visible primary fluid inclusion with a moving gas phase. Along the interface, where the two growing crystals came together, negative space was created. This form of primary fluid inclusion hosts fluid remnants that were present when the fluorite was growing. When comparing the two photomicrographs in figure 2, the movement of the gas phase can be clearly seen. Fluid inclusions like this are not at all common in fluorite. John I. Koivula is analytical microscopist at GIA in Carlsbad, California.